World champion Wave Carver's 3-year-old Water Front posted a new record time for training races at Remington Park on Wednesday. OKLAHOMA CITY, OK�MARCH 12, 2014�In the 13th and final training race on Wednesday afternoon at Remington Park, Water Front cruised over the 250 yards under a hand-ride to win by 2-1/4 lengths. Aided by a 16-mph tailwind, she also crossed the finish in new record time for training races. 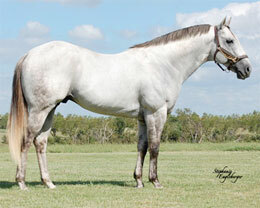 Owned by Rick Sumner of El Reno, Okla. and trained by Guillermo Valdivia, Water Front covered 250 yards over a fast track in :13.147 seconds under jockey Alex Baldillez, Jr.
A 3-year-old filly Oklahoma-bred filly by Wave Carver from the Tres Seis mare Caddo Ridge, Water Front has yet to make her career debut. Counting the training race, Water Front has now had three workouts in the last month at Remington Park to prepare for her first start.